The irony in the history of our two major political parties is rich. Both parties actually stated out representing the opposite constituencies which they represent today. The history of this switch is largely blamed on the so called “Dixiecrats”; those Southern Democrats who in 1948; when Truman proposed a Civil Rights platform at the Convention; walked out, dividing the democratic Party forever and giving rise to a Republican faction which would someday become known as “Neo-Conservatism.” That’s the short, contemporary side of things. But there is an interesting history which goes even further back. Originally this country had a myriad of political parties; with the two largest being the Federalists and the Democratic-Republican Party. The Federalists believed in a strong Federal government; Washington and Adams were both Federalists. The Democratic-Republicans believed in a Republic guided by the voice of democracy. Remember a “Republic” is the form of democracy which we live under, and not just the name of a political party. Likewise, representative democracy is the manner in which we conduct our affairs within that Republic. So, there were two main parties back then; divided as to how much power the Federal government should have over the lives of its citizens. In other words; nothing has changed with the system itself; only the players are different and call their parties by different names while still representing the same old interests. By the 1840’s the Whig Party; formerly known at the time as Democrats, who had been around since the Revolution and were the real Conservatives of the era; got their first President elected. That was William Henry Harrison. He only lasted 32 days, dying of a cold he caught during his inauguration ceremony. However, he was succeeded by John Tyler, a former Democrat. The Whigs held sway through the Presidency of Franklin Pierce, and were largely responsible for some of the worst decisions leading up to the Civil War. At the same time the Democrats were doing all they could to avoid a war with the South; even advocating the retention of slavery in the Southern states. These were the same men who were opposed to the 13th Amendment freeing the slaves. So, what we had; in essence; was a Democratic Party which was not at all in tune with the push for human rights; but rather pro States Rights. And; conversely; a Republican Party which was perceived as being the “Deliverer of Freedom” to the slaves and by extension the “Party of the People.” This has, of course, has been turned on its head by what happened at the Democratic Convention of 1948, but there are interesting things to note between the time of Lincoln and then. Interestingly Lincoln’s Vice President; Andrew Johnson; was a Democrat who had been elected to the office on the National Union-Republic ticket. At the time we were still not yet confined to only 2 viable parties. From 1869-1885 we had only Republican Presidents; along the line of Lincoln. These were the years of Reconstruction followed by the Gilded Age. Reconstruction was a repressive occupation of the Southern states; which came to embitter North against South to this present day; while the later Gilded Age represented the advent of the rewards of industrialization and the greed which those rewards brought to the rich and powerful. The Republicans; at this point; became the party of big business. The Democrats came to embrace the working class and the rise of the Unions. The Republican run ended briefly to accommodate the election of Grover Cleveland in 1885. He was a Democrat. From this time forward there would never be anything but Republicans and Democrats running against one another for the office of President. It would be well to remember that there had been; as noted here earlier; a Democrat-Republican Party. Indeed our 3rd through 8th Presidents were from that Party. And there were some pretty great Presidents in that group. Aside from Cleveland’s return to office in 1893; after having been defeated by William Harrison in 1889, which is the only time a former President has been re-elected to office; the Republicans held sway until President Wilson; a Democrat; came to D.C. in 1913. The first thing he did was to segregate the nation’s Capital. That’s right, D.C. was not segregated until 1913 and then by a Democrat! After Wilson the mantle of leadership went back to the Republicans for the disastrous social policies of Prohibition, the reckless economic policies of the Roaring Twenties and the resultant Great Depression. In 1933 FDR came to D.C. as the first Democrat since Wilson and began the social programs which so many Americans rely upon today to make ends meet. 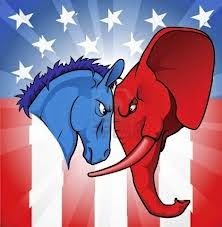 And this is where the division between the two parties as we know them today begins to take place. The Democrats had to find a way out of the Depression which had happened during the years of Republican leadership; which let big business run themselves. The New Deal programs; such as the NRA, WPA and all the rest were the country’s first attempts at large scale social programs to alleviate the hunger, homelessness and lack of education and job training which came in the wake of those failed Republican policies. The Republicans now became cast as the enemy of the working man and the party of the rich. Right or wrong, these labels would stick. The only ones getting short changed by all of this were the nations African-Americans. The Party of Lincoln was the party which most blacks identified with due to Abraham Lincoln. That’s understandable. Regardless of the finer points involved in the validity of the Emancipation Proclamation, he was the man in charge when they received their freedom. And the Democrats had opposed the 13th Amendment. It seemed like a no-brainer. But in between the two World Wars, African –Americans expected more and began shifting their allegiance to the Democratic Party, which promised at least the hope of change. They had served honorably in 2 World Wars defending freedoms for others which they themselves did not have here at home. The time to change that had come. So, the nail was set in place; it just needed one more firm whack to drive it home for good. That final whack came in 1948 at the Democratic National Convention when Harry Truman; who had succeeded President Roosevelt upon his death in 1945; came out with a Civil Rights platform for African-Americans. The Southern Democrats walked out and formed their own party. They even ran their own candidate; and predictably embarrassed themselves. After the election was over the leaders became some of the leading Republican Senators for the remainder of the 20th century, most notably leading the opposition to the Civil rights legislation of the 1960’s and giving birth to the so-called Conservative movement in 1964 with Barry Goldwater as the first “Conservative” candidate for President. The Democrats became even more progressive than they had been. This enabled deep divisions to develop within the party. And although they were able to successfully elect the first African-American Pesident; Barak Obama; to office in 2008, the Democrats then lost control of both the Congress and Senate within his first term. The only point to be made here; if any at all; is that party allegiance; based on history; is suspect at best. It’s also interesting to note how much worse the gridlock in Washington became after the rise of the 2 party system we have today; which consists of Democrats and Republicans. Especially since at one time they were one and the same. That bit of history serves to underscore just how little choice we have today in electing our representatives. They are both different sides of the same coin. This goes a long way in explaining why nothing ever really changes.